At 1653 local time, Georgian SOF operator Nikoloz Kimerioni accidentally dropped the totality of the communications equipment of his team into the violent currents of a rain-swollen Khipsta River. Team Alpha has gone silent a few minutes after calling for CAS. A couple of minutes earlier, eager to get a better sight at an unidentified group of men suspiciously moving on the slopes north of Abgara (12 km north of the Gudauta Military Airport), Nikoloz decided to take advantage of the clear lines of sight offered by the riverbank. Moving from boulder to boulder and attentively listening to his earpiece, he settled for a tall rock. He could see the two A-10Cs he called for support, and waited with much anticipation for a readback. But he lost his step and sled down the rock, barely avoiding falling into the waters. His radio, along with the Tactical Tailor pouch, easily detached from his plate carrier because of a lousy MOLLE job. Both took a dip into the waters of the river, never to be seen again. This blog post is about how to set up a communications disruption in CMANO and how such disruptions affect the tactical picture of the player and his virtual units. I wanted to simulate a couple of A-10Cs (Flight 544) staying in a holding position, waiting for calls from a land unit (SOF Team Alpha). And from there, the land unit's radio gone. To edit an scenario with communications disruption, the first thing to do is to set it up in a way that allows such thing. 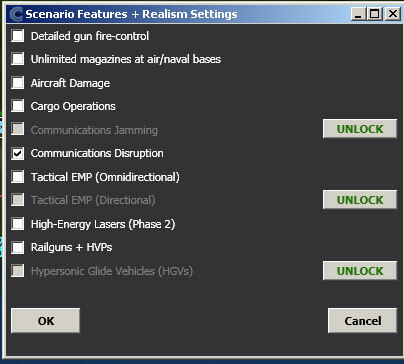 Editor->Scenario Features + Realism Settings. Check the Communications Disruption option. I then created a ASuW (ground mission) with a patrol area in the sea (red area in the screenshot below) and assigned the two A-10Cs to it (Flight 544). I know there are no targets in the "patrol area" so it is more like a holding position for the A-10Cs to loiter. 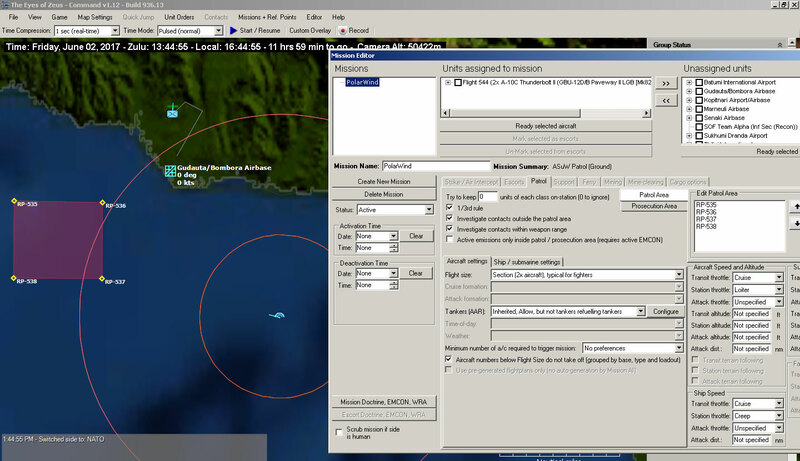 There are plenty of places to learn how to add a mission in CMANO. Note how I ticked on the option to let the A-10Cs to investigate targets outside the patrol area. By allowing the A-10Cs to investigate contacts outside the patrol area, the A-10Cs will rapidly go an check out contacts obtained by other units like SOF Team Alpha. This is a rather lousy/lazy way to simulate a CAS request from the SOF Team Alpha. But it works just fine in this low unit density scenario. And now, how to set up the communications disruption. In this Warfaresims.com article, it is explained that it can be done in a variety of ways. From just checking an option in the unit properties menu, to manually setting the damage of the hardware used for communications. The third option, which is also explained in the article, is to use some lua scripting. I know nothing about programming, but I decided to give it a try. 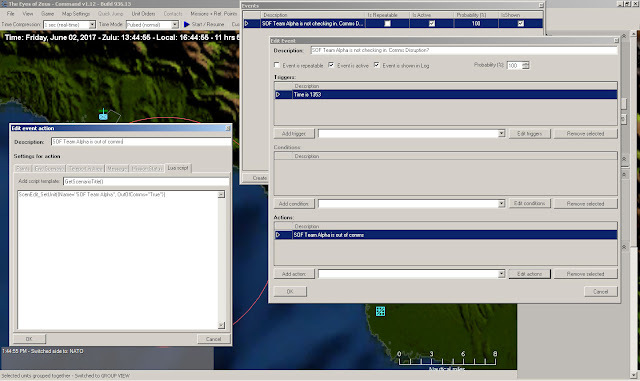 Setting up a comms disruption via a trigger was quite easy, I just used the code shown the Warfaresims.com article. I created an event that is triggered at the time in which Nikolai dropped off his radio into the water. 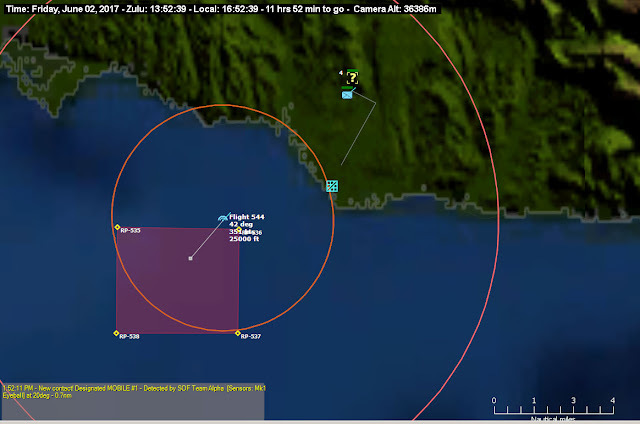 The action (shown in the left window) was to leave the SOF Team Alpha out of communications. That's the same code shown in the article, with the name of the unit changed off course. And that's it! The action can take place without my intervention. So I just click "play" and sit back to watch what happens. Start of the scenario. SOF Team Alpha is on patrol north of Gudauta airbase. Flight 544 is moving towards their holding position. 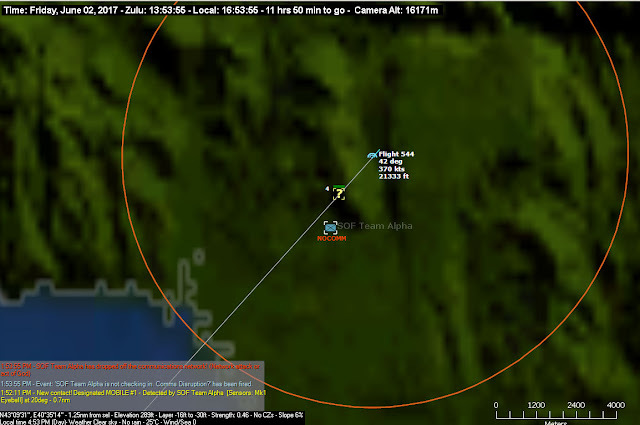 SOF Team Alpha has detected suspicious activity and has called Fligh 544 in support. Note how the A-10Cs abandon their holding position (AKA patrol area) and move towards the new contact. And a repetition of the tactical picture of the moment that Nikoloz took a bad step. 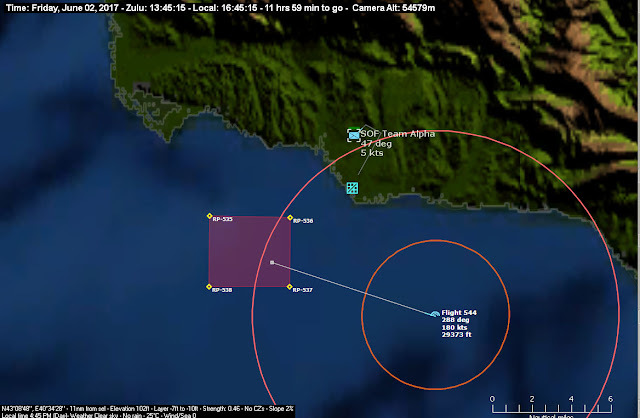 Flight 544 continues their mission against the Abkhazian insurgents. 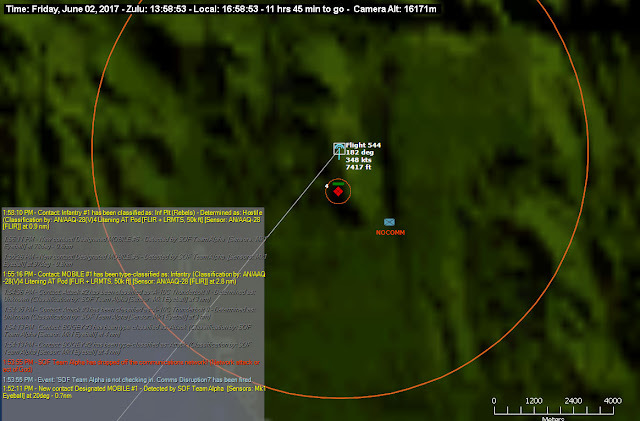 Even without any contact with SOF Team Alpha, Flight 544's virtual commander "remembers" the contact position and now it has identified it as a hostile Abkhazian dismounted militia. But as you can see from the message log's gray entries, SOF Team Alpha is getting into trouble. Many thanks to Mike and Dimitris from WarfareSims with their help with the lua script. 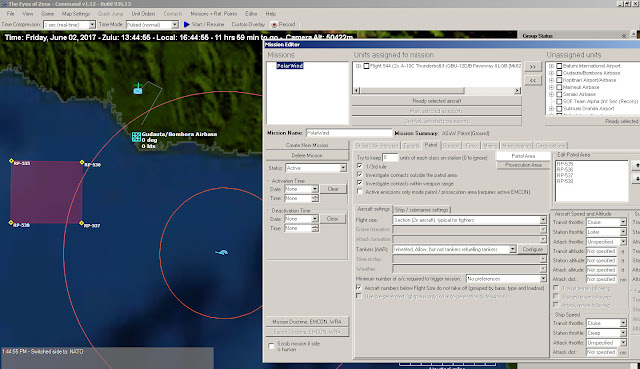 Your post has had me revisit CMANO after a long long hiatus, and the latest build has come a long way since v1.0 beta / release. It's approachable and as deep as the Mariana trench. I am still utterly crap at it though. Just more knowledgeably crap and with less UI clicking required to uncover my fundamental crapness.